I had the pleasure of giving one of the Milo's I have been working on to a wonderful friend this weekend. I really do love giving gifts, especially when it is a handmade gift. There is something pretty special about sharing my love of crafting with the people who are special to me. Another Milo came off the needles this week, and another one was cast on. This is the fourth of five. These little vests are a joy to knit up, and I so look forward to seeing them on all the little ones arriving this fall. I am still focused on my doula reading, and will be for quite some time. I do like to have something else going while I am studying, something to take me away from the studies once in awhile. This week I picked up The Small Scale Poultry Flock. It came highly recommended by Ginny and I knew we had to read it. Just getting into it, but so far I really like it and think it will have a lot of great information for us about looking after our little flock. 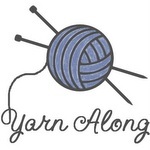 Linking up with Ginny over at Small Things for Yarn Along. I'm sure your friend appreciated it greatly. Sometimes when I give gifts, I worry about the ends unraveling - I must find a new technique. And I must really try out this Milo pattern. Like the color of the new one - pearly gray. It is great, isn't it? I love getting handmade gifts for Reece (and for me). I don't think there is anything better than hand made gifts. i love the milo vest! i'd love to work on one myself! what yarn are you using? and the book looks interesting. i wonder if i had space for chickens, if i would consider getting them? hmmm . . . have a good wednesday! Thanks, yarn is a merino/cashmere blend, very nice to knit with. They don't take a lot of space, and not nearly as much work as we thought. Super fun to have around and Reece loves them. You are so very productive with the gifts! I wrote my holiday list the other day and thought of you. However, I have not cast on anything. Love the green! Yay for holiday list making, I always feel so good once I know what I am making for everyone. You're so fortunate to have friends who appreciate hand made gifts! I love to share, too, but have had my pride hurt with too many "oh, that's nice" reactions and I'm afraid I've become very selective about who I will knit for! I am very lucky. The people I am knitting for our pretty special and I know they will truly appreciate the time, love and effort that went into making it. I don't think I would do it if I knew it wouldn't be appreciated.